How can your dog make your comms more creative? Can you be inspired by whisky? Do you bring your inner-child to work? All fascinating ideas from my interview with PR legend Sarah Hall, in this first Comms Creative Q&A. Sarah is a pioneer of best practice in the PR industry and is a holder of the CIPR’s Sir Stephen Tallents Medal 2014 for exceptional achievement in public relations practice. I’ve admired her work for ages so it was a thrill to hear her answers to my regular Comms Creative newsletter questions. 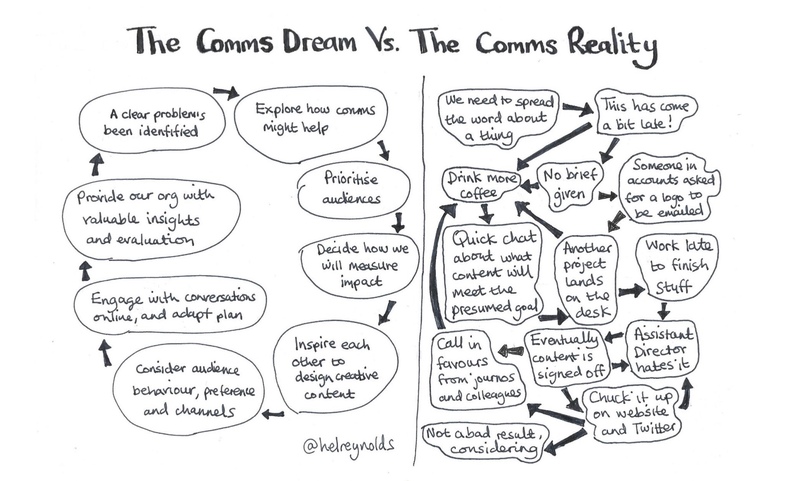 I’ll be blogging the Comms Creative Q&As here every month – but if you want to be the first to read them and loads more creative comms jazz, sign up to the newsletter. Hi Sarah! Please tell us a bit about yourself. I’m a PR and marketing agency owner, the CIPR President for 2018 and the founder and editor of #FuturePRoof. Alongside this I’m a committee member of Athena40, which is focused on accountable leadership, female empowerment and youth development. On a personal front I’m Mum to two boys and have the good fortune to enjoy a lovely blended family of five thanks to my partner and his three children. What are your creative strengths when it comes to comms? It sounds immodest but I can quickly look at a brief and come up with a solid campaign concept that will achieve the desired business outcomes. As an accountable leadership advocate the challenge of linking social purpose with organisational objectives is something I really enjoy. I’m very much an ideas person so I’m careful to keep process people around me to balance things out. I learnt an important creative lesson from former boss, Stefan Lepkowski of Karol Marketing. Stefan would never be disheartened by a low budget project. He’d ask what we’d do to meet the business objectives if money was no object. Any idea went and if we hit on something solid he’d find a way to make that happen, which usually meant winning additional business from other brands to build something really valuable. Can you share a piece of creative work you’ve seen that you love? There is a video featuring Robert Carlyle which is six minutes in length and tells the story of how Johnnie Walker whiskey came to be. It’s an authentic piece of comms which shows there is most definitely a place for longform. Similarly Chanel’s Inside Chanel videos are a beautiful example of brand storytelling – the type of content that we would do well to emulate and harness in everyday comms. What advice would you give to a comms professional to help them tap into their creativity? Where you can, take time out. I often come up with good ideas when I’m running with the dog because I’m totally switched off. Also, watch how children approach any project they’re working on. They have no pre-conceptions about how to do things and aren’t afraid to experiment. Unlearning processes and starting from scratch is a hugely liberating way to approach work and can yield surprising results. I’ve just launched #FuturePRoof edition three so I’m keen to plug that but the big drum I’m continuing to bang via the CIPR is the need to approach public relations as a strategic management function. Doing this helps us re-evaluate how we approach our CPD, how we describe what we do and gain the ear and respect of the C-Suite. The call to action is to make CIPR Chartered Practitioner status your goal. That’s fantastic – thanks to Sarah for being the first guest in The Comms Creative Q&A. Take a look at Sarah Hall Consulting, for more information on Sarah’s work. Previous The Comms Creative: fancy some inbox inspiration?